TV with Thinus: TV CRITIC'S NOTEBOOK. Brooke, Brooke! As the SABC fawned over American soap star Katherine Kelly Lang, spare a thought for the local talent the public broadcaster can't bother to give the same media exposure to. TV CRITIC'S NOTEBOOK. Brooke, Brooke! As the SABC fawned over American soap star Katherine Kelly Lang, spare a thought for the local talent the public broadcaster can't bother to give the same media exposure to. When her alter-ego Brooke strutted into the Flames Lounge at the Four Seasons Hotel in Johannesburg's Westcliff last week as she soaked up the adoration by the bold and the beautiful, Katherine Kelly Lang had no inkling of how the South African public broadcaster's fêted fawning over her as an American soap star once again etched a sharp contrast with how little similar effort the SABC actually puts in for local talent media exposure. 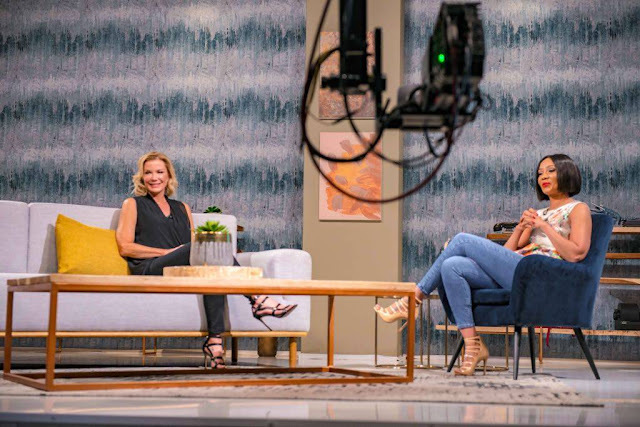 From Port Elizabeth to Johannesburg, from Soweto to Cape Town, the SABC fell over its feet to create and shape public and media exposure opportunities for the American actress Katherine Kelly Lang, better known as Brooke in BBL's The Bold and the Beautiful soap on SABC3. Not to take anything away from Katherine Kelly Lang, but it was sad and disappointing to to see the past two weeks how she got whisked from Umhlobo Wenene to being given a walk-on guest appearance on SABC3's Isidingo; went from sitting down on #WTFTumi, to interviews with Good Hope FM and given a Top Billing insert. Between interviews on Real Talk with Azania, Radio 2000, Metro FM, 5FM, Expresso, Maponya Mall and Menlyn Mall meet-and-greets, as well as a special media dinner, two thoughts kept re-occuring in my mind. Firstly, why is the SABC going with a play-and-spray approach, foisting Katherine Kelly Lang onto every conceivable SABC media platform it can, as if she's of importance and has relevance for apparently every audience under the SABC sun? Secondly - and much more importantly - why is the SABC giving such an unbelievable lot of exposure to just one woman, on just SABC on-air properties, who is a soap star on a American TV production, in a show that the South African public broadcaster didn't really even want anymore and did it best the past three years to undercut, destroy its ratings with insane timeslot changes, and get rid of? Not even for Safta winners of SABC shows or its biggest stars from shows like Uzalo or Generations or Skeem Saam, or Muvhango and Isidingo for their 20th birthdays, or Top Billing for its 25th birthday has the SABC ever given even half the publicity blitz on SABC platforms it gave to Katherine Kelly Lang in just the past two weeks - and that is actually shameful. Why is the SABC - and again, not taking anything away from Brooke - able to mount such an obsessed publicity effort with Katherine Kelly Lang and giving her so many opportunities to speak to and to be seen by SABC audiences, when the public broadcaster cannot do the same for big local stars? Where are the same effort and SABC opportunities by the SABC for worthy TV show's local moments and local stars when they rightly deserve to shine in the spotlight? Where are their flowers? Where are their mall "activations" to meet the adoring crowds? With Katherine Kelly Lang and the SABC's TV head publicist Zandile Nkonyeni hovering around on her national publicity tour, the SABC through its optics, once again showed its unhealthy and unbalanced reverence for American shows and stars above local ones. When last did the SABC invite media to the Four Seasons Hotel in Westcliff to meet lets say a Leleti Khumalo when she returned to television for Uzalo? Or to toast the presenters of Top Billing celebrating a quarter of a century on the SABC at the moment as the broadcaster's longest running TV show? Of course the answer is never. Why are they not interviewed on every SABC radio station, making appearances on every SABC show, and being showcased at the Maponya Mall? It's tragic that the SABC still jumps - and jumps higher - for America's blond, bold and beautiful, than for South Africa's local brilliant on-screen talent. What's even worse is the (wrong) non-spoken message the SABC is communicating to everyone who saw this: When it comes down to it, an American soap star is more important, and deserving of more effort, of the coverage, of the fawning, and of opportunities to be on SABC shows and being interviewed on radio than South Africans. Can the SABC name one local talent it's ever given even half in a week of what the SABC gave Katherine Kelly Lang? Someone once said it's not what I say is important to me that is important, but what I do and who and what I give my time to, that truly reveals what is really important to me. It's not a problem, or wrong, to fawn over Katherine Kelly Lang or an American star who happens to be in South Africa. A lot of them are here often and they get interviewed and do media appearances. Other broadcasters like M-Net and other channels or MultiChoice's DStv like FOX are used to it, experienced and well-versed in it, and behave normally without going overboard. What is wrong however, is the level of total ga-ga fixation the SABC displayed when it showed how much coverage on SABC platforms it's willing to give (and can actually give) to an American on-screen talent on the public broadcaster - something that makes you wonder why the SABC isn't doing this, and hasn't been doing this, for our own.